Fabian Schar's fifth-minute header proved decisive as Switzerland edged out 10-man Albania 1-0 in their Euro 2016 opener at the Stade Bollaert-Delelis on Saturday. Albania goalkeeper Etrit Berisha ventured off his line to try and claim Xherdan Shaqiri's corner but was beaten to the delivery by Schar, who got Switzerland's Group A campaign off to a winning start. Gianni Di Biasi's team scored just 10 goals in eight games during qualifying and their task was made all the more difficult by the dismissal of captain Lorik Cana, earning his 91st cap. The defender received a second booking for a handball on the edge of his own box, and the right-hand post stopped Blerim Dzemaili compounding their misery from the ensuing set-piece. Despite being a man light Albania pressed for an equaliser, while Berisha tried to make amends for his costly error by making a string of saves from Seferovic. There was to be no addition to the scoreline, however, Albania substitute Shkelzen Gashi wasting a glorious opening in the 87th minute with defeat putting pressure on the Eagles to get a result in their next match against hosts France in Marseille. A positive start from Switzerland paid dividends within five minutes when Shaqiri's in-swinging corner from the right was met by the head of Schar, who steered the ball into the back of the net to leave Berisha flapping at thin air. Dzemaili combined with Haris Seferovic to send the latter straight through the heart of the Albania defence 10 minutes later, but his shot was straight into the goalkeeper's arms. Although Taulant Xhaka blazed Albania's first sight of goal over the top it helped his team gain confidence and they forced Switzerland goalkeeper Yann Sommer into action in the 31st minute. Sommer raced off his line and stuck out a leg to stop Armando Sadiku bending home Elseid Hysaj's sublime pass around the back of the defence. 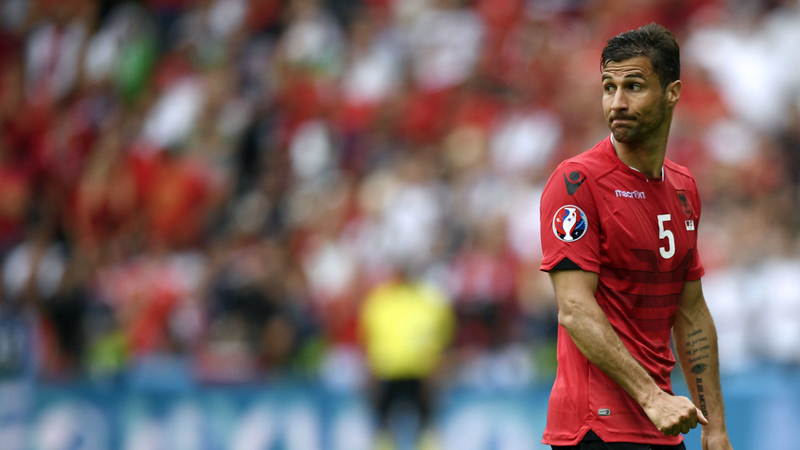 However, Albania suffered a huge blow before half-time when Cana was shown a second yellow card. The captain slipped while racing back towards his own box with Seferovic and handled the ball in his attempts to stop the striker going clean through. It could have been even worse for Albania had Dzemaili's thunderous effort from the subsequent free-kick on the edge of the area not cannoned back off the post. Switzerland could smell blood, but Dzemaili fired wide and Seferovic was denied by Berisha as Albania held on until half-time. Vladimir Petkovic's team were given a scare when Sadiku came close to latching onto a loose touch from Johan Djourou inside the box, and they responded through Seferovic, who was again kept out by Berisha. Taulant Xhaka was part of European Championship history as he lined-up against his brother Granit, and he made no effort to hide his anger at being substituted in the 62nd minute. 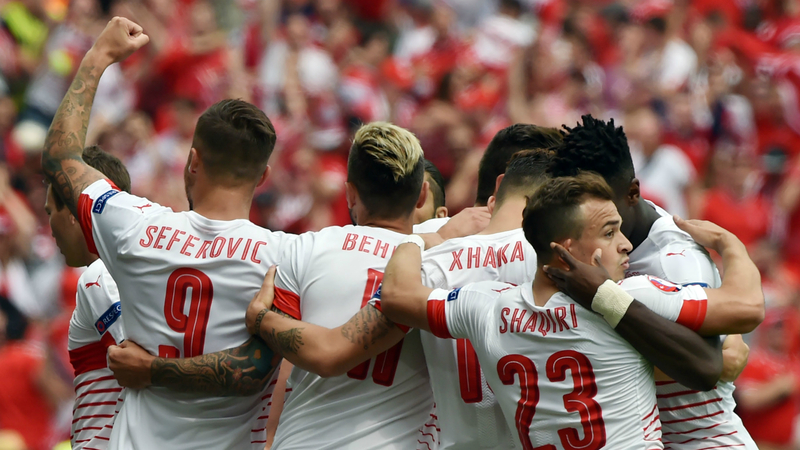 Switzerland introduced Breel Embolo and he made a rapid impact when he released Seferovic, who was once again kept out by the resurgent Berisha. Albania continued to fight and Sadiku drilled into the side netting after latching onto another incisive pass from Hysaj as the clock wound down. Gashi had the chance to salvage a point with three minutes remaining when he sprung the offside trap, but Sommer charged out to deflect his effort over and assure Switzerland of three points.